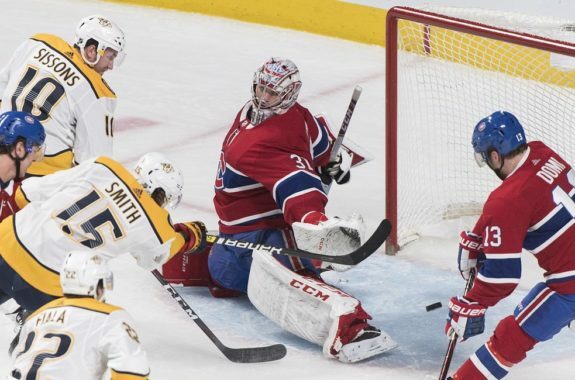 MONTREAL — Craig Smith scored twice as the Nashville Predators defeated the Montreal Canadiens 4-1 on Saturday night. Mattias Ekholm and Viktor Arvidsson, into the empty net, also scored for Nashville (25-15-3) while P.K. Subban had two assists. Juuse Saros stopped 27-of-28 shots in place of Pekka Rinne, who played Friday in a 4-3 overtime loss against the Detroit Red Wings. Captain Shea Weber scored for the Canadiens (22-15-5) against his former team. Carey Price made 28 saves as Montreal lost for the first time in three outings. It was the second matchup between Weber and Subban since the summer 2016 blockbuster trade between the Predators and Canadiens. The two defencemen also faced off on Mar. 2, 2017 when Montreal won 2-1 at Bell Centre. The Predators have now collected points in four straight games (3-0-1) despite recent injuries to Filip Forsberg, Kyle Turris and Yannick Weber. Nashville was the faster and sharper team on the night, especially in the first period when the visitors outshot Montreal 16-11. Smith extended his personal point streak to five games when he put Subban’s rebound past Price at 10:44 of the first period to give the Predators a 1-0 lead. Smith has scored in three straight games. Nashville went up 2-0 with 36 seconds remaining in the first after Ekholm’s slap shot took a slight deflection off Max Domi’s stick to fool Price top shelf. Weber got one back for the Canadiens at 12:47 of the second period when he threw a bouncing puck on net that sailed past a few Predators players. It was Weber’s second career goal against Nashville. Smith answered back 18 seconds later with a wraparound for his second of the game and team-leading 14th of the season. The Canadiens challenged for goalie interference on the play but the call on the ice stood. Subban notched his second assist on the play and his third point in the last two games after a six-game pointless slump. Subban has 300 career assists. Montreal made a push in the third period but Saros stopped all eight shots he faced. Arvidsson added an empty-net goal for the Predators with 45 seconds left in the game. Notes: The Predators play four more games on their current season-high six-game road trip.